Five years ago today, the Space Shuttle Atlantis and the Space Shuttle program itself took its last flight into space on mission STS-135 to service the International Space Station (ISS). 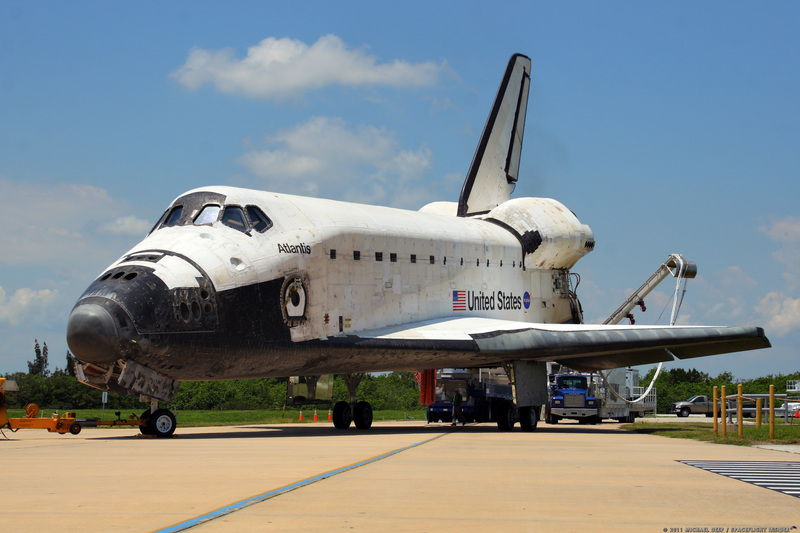 Since that last flight in 2011, the Shuttle orbiters have been flown off to museums across the country and NASA’s human spaceflight program has shifted to other missions and other vehicles. No other American human-rated spacecraft has been flown so often or accomplished so much. According to NASA, over the course of thirty years the five Space Shuttle orbiters flew 355 individuals—852 fliers, with some flying more than once. One astronaut, Story Musgrave, had missions on all five orbiters. In total, the five Space Shuttle orbiters accumulated over 307 days of mission time and over 542 million miles of orbital travel. That historic final flight, which lifted off at 11:29 a.m. EDT (15:29 GMT) July 8 from Launch Complex 39A, took a multipurpose logistics module containing supplies and spare parts for the space station. The mission’s four astronauts–Commander Chris Ferguson, Pilot Doug Hurley, and Mission Specialists Sandy Magnus and Rex Walheim—completed their mission two weeks later, landing in the early-morning dark at 5:57 a.m. EDT (09:57 GMT) July 21 at the Kennedy Space Center. In the five years since the shuttering of the program, NASA has yet to launch an American astronaut from U.S. soil. However, the agency is developing programs in cooperation with traditional NASA contractors, entrepreneurial firms like SpaceX and Boeing as well as the Russian space program to ensure more diverse human spaceflight activity in the near future. NASA recently paid around $490 million to ferry U.S. astronauts to and from the ISS through 2017 using three-seat Russian Soyuz spacecraft flying out of Baikonur Cosmodrome in Kazakhstan. U.S. dependence on Russia is expected to continue until companies like SpaceX and Boeing prove their capabilities to launch crew safely under NASA’s Commercial Crew Program. Both SpaceX’s Dragon spacecraft and Boeing’s CST-100 vehicle are in development. The human-rated version of Dragon is undergoing structural load testing and astronauts are starting to practice crew egress from the vehicle. The cargo version of Dragon has already flown to the space station seven times. CST-100, with manufacturing facilities set up in part of the facilities that once supported the Space Shuttle at Kennedy Space Center, is likewise undergoing evaluation by NASA astronauts. Both commercial vehicles are slated to begin flight testing in 2017. Meanwhile, on the exploration side of things, NASA and its contractor partners continue work on the Orion multi-purpose crew vehicle and heavy-lift Space Launch System rocket. Orion and SLS are designed to be the initial capabilities for eventual human exploration beyond Earth orbit. Orion, a redesigned version of a vehicle that was first developed in 2004 as part of the now-canceled Constellation Program, had its first uncrewed flight test, Exploration Flight Test One (EFT-1), in December 2014. Flying aboard a Delta IV Heavy rocket, the pressurized test article made two orbits of Earth before splashing down. Meanwhile, NASA continues to build test stands and test hardware in preparation for SLS, its first new heavy-lift launch vehicle since 1981. The next uncrewed flight test, Exploration Mission 1 (EM-1), will fly an Orion capsule around the Moon in late 2018. The mission will also be the first flight of SLS. The Orion/SLS system is expected to fly its first crew beyond Earth orbit on the EM-2 mission sometime between 2021 and 2023.